Posted on December 8th, 2008 by StuFF mc. Update (Aug. ’09): We have now reached the version 1.2 of Pick&Play, with tons of news things… Enjoy! There you have it! It’s official, we can speak about it ! One of the iPhone Apps I have been working on will soon be pushed to the App Store, probably next week. It’s called “pick&play”, it’s a contract from Pikeo by Orange, and it’s a funny memory game, pretty different since you actually win new funny pictures every time you win a game. Click on the screenshots to get them bigger :-) I’m sorry if they’re in french, the app is also in English (and spanish! ), don’t worry! Of course it’s gonna be free for all of you in a few days (as long as our friend at Apple lets us in without too many troubles) but we’d like to reserve a special Preview version of the app for our dear friends Bloggers and Podcasters. They can get it by following the info in the following PDF, the official press release of Pikeo by Orange. If you’d like to support Pomcast, it’s a very simple way to do so. Speak about it, download it, show it to your friends, etc, … Pomcast.biz is clearly what now finances Pomcast.com, even though these are 2 “relatively” independent entities :) For those of you who’ll be tomorrow at Le Web tomorrow, look out for a big guy with a black T-Shirt Pomcast / “Pom staff” (or a Sweat Shirt “San Francisco” if Loïc forgot the heating…) and I’ll show you what the app looks like. And now go ahead, check out those other screenshots on the rest of this post and download the PDF ! Posted on December 3rd, 2008 by raoulito. Let’s improvize something! Improvisons ! I’ll be in Paris this Saturday. I want to meet with the community “Iphonecamperope” . Let’s propose some places where we could stay. Je suis à Paris ce samedi et j’aimerais rencontrer la communauté “Iphonecamperope”. Proposons des endroits oà¹ nous pourrions nous retrouver. Posted on November 4th, 2008 by StuFF mc. The guy red-crossed will be soon replaced by an ex-IBM guy. Posted on October 21st, 2008 by ant_one. Buying a new MacBook (Pro)? Posted on October 14th, 2008 by StuFF mc. 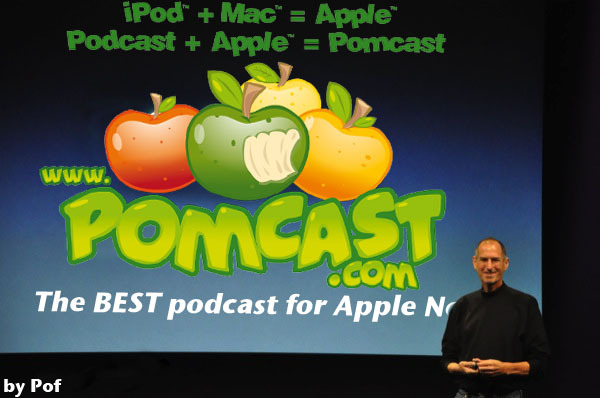 Please support Pomcast by using the banner on the top right corner of our site. Thanks! Posted on October 13th, 2008 by StuFF mc. Our friend Thierry Weber and his Team organize “The first iPhone conference for decision makers” in Geneva on October 31th, 2008. We’ll speak more about it in Pomcast. Posted on September 11th, 2008 by StuFF mc. Check out gizmodo for more information.